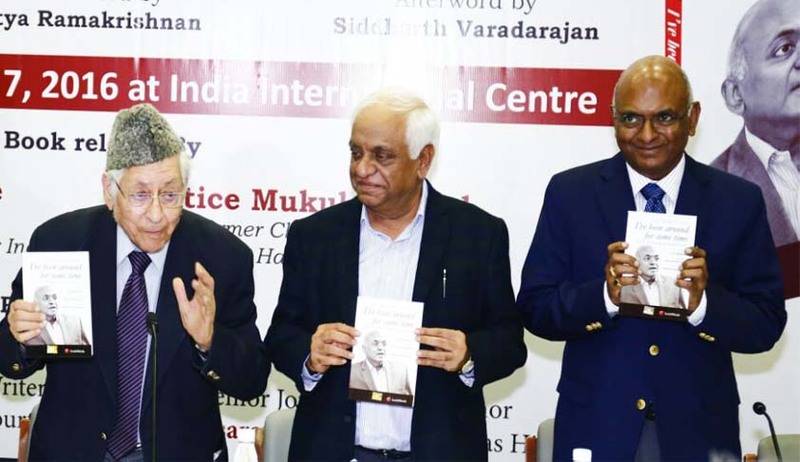 In a free-for-all hilarious fun-filled event, Senior advocate of the Supreme Court, Raju Ramachandran, was the object of pun and jokes, which he equally enjoyed, with a hall full of his admirers and critics, on December 7, at India International Centre, in New Delhi, where his semi-autobiographical book, “I’ve been around for some time: Analyses, Reflections and Reminiscences’, was released. The book carries a Foreword by eminent author, A.G. Noorani, Middleword by well-known advocate, Nitya Ramakrishnan, and Afterword by Founding Editor of The Wire, Siddharth Varadarajan. The book release function was followed by a panel discussion, on various themes picked from the book, by diverse and eminent panelists. The panel comprised of Advocate, Aman Ahluwalia, Advocate and columnist, Suhrith Parthasarathy, senior journalist and author, Saba Naqvi, Writer, Mukul Kesavan, and was moderated by advocate, Gopal Sankaranarayanan. Unelected Judges can’t have the power to annul amendments passed by Parliament by special majority. In the NJAC judgment, the Supreme court trivialised the basic structure doctrine, saying it is not independence of judiciary, but its primacy which constitutes the basic structure. It is like saying it is not architecture, but bricks and masonry which are fundamental. Judges can’t go feature by feature to decide whether a particular feature constitutes basic structure of the Constitution. When Mrs Indira Gandhi asked Justice Krishna Iyer what is basic structure, the latter asked her: Can India become a Monarchy? Can India become a Theocracy? When Indira Gandhi answered him in the negative, Justice Iyer told her that was basic structure. The recent interim order of the Supreme Court making it mandatory for all to stand and sing national anthem at the beginning of the screening of feature films in theatres,is counter-productive. The way the Supreme Court treated the former Judge of the Supreme Court, Justice Markandey Katju, although he is a maverick of sorts, is disappointing. The Supreme Court’s stand on gender sensitivity, at times, is not upto the expectations. Judgments by Supreme Court tend to be longer these days because every Judge wants to contribute his little bit to the history, especially in landmark cases, which is not desirable. Asked to comment on why certain Judges use funny English in their judgments, Ramachandran said, the answer could be found in why he invited only those Judges, whose judgments everyone would admire. We are not in Emergency situation, and therefore, we can’t be hypersensitive and distrust the Government in the appointment of Judges. A strong and healthy judiciary is important in times of brute majority of the ruling parties; A judiciary which is independent and willing to stand up is a must. Justices S.A.Bobde, Rohinton Fali Nariman of the Supreme Court, Justices Ravindra Bhat, Gita Mittal and S.Muralidhar of Delhi High Court, CPI(M) Leader, Sitaram Yechury were among those who attended the event.